This morning while I was browsing Fast Company Design, I stumbled upon a rare interview with graphic design legend, Massimo Vignelli. For those of you who don’t know Vignelli, he was a versatile Italian designer who worked across a broad range of disciplines including interior design, environmental design, package design, graphic design, furniture design and product design. Vignelli’s ethos was, “If you can design one thing, you can design everything.” His most famous body of work is arguably the New York City Subway Map and the New York City Transit Authority Graphic Standards Manual. 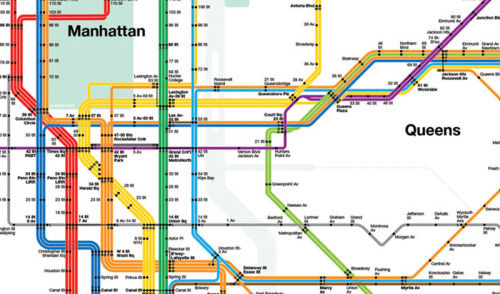 In August 1972, the MTA unveiled a drastically different subway map designed by Vignelli. It showed the transit system as a series of straight lines that sometimes veered at 45 degree angles, rather than a more realistic tangle of curved paths. Most other metro systems in the world, such as London, used a diagrammatic, not a geographical approach. New York, with its system of local and express trains, presents complications in mapping that no other transit system faces. Vignelli’s diagram, along with the MTA’s neighborhood maps that came along later, were intended to work together to guide customers through the system, then to their street destination. He later argued against that decision by saying the map should focus on the subway system and not include distractions like geographic references. Millions of New Yorkers are exposed to Vignelli’s work on a daily basis and I’d bet few actually pause for a moment to appreciate its brilliance. Many of us take getting around the city for granted, but it’s a scary and intimidating place if you don’t know where you’re going. Vignelli’s simple and elegant designs helped make New York easier to navigate and a better place to live and visit. I’m fascinated and inspired by the designers, artists and thinkers that have helped shape New York City into what it is today. Vignelli is one of those people that I admire.